Looking for a COMFY chair? 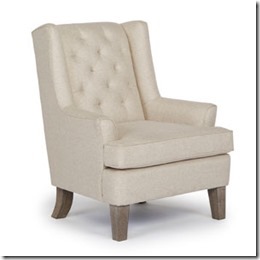 How about a wing chair? Choose from many, many fabrics! With small accent wings and rolled arms, the Vespa chair is soft and inviting. 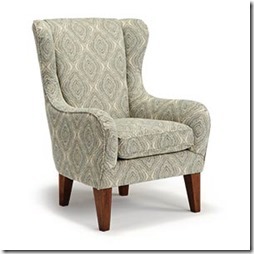 While the features may be demure, the comfort of this wing back chair certainly is not. Resilient, reversible seat cushions and a solid-wood, kiln-dried frame parts are the perfect combination for lasting comfort. The Rebecca wing back chair is a modern take on a traditional classic. The button tufted back lends itself to an elegant look, while the slightly flared arms and clean lines of the wings and reversible t-cushion offer a more modern feel. 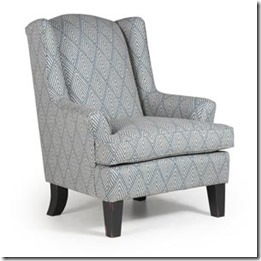 This versatile chair is available in four different finish options and many different fabric. It’s human nature. A gentle rocking movement almost automatically lulls you into a state of complete relaxation. You can let go of your thoughts, forget about your to-do list and just be in the moment. The inviting Paisley wingback rocking chair helps facilitate that sense of easy repose. 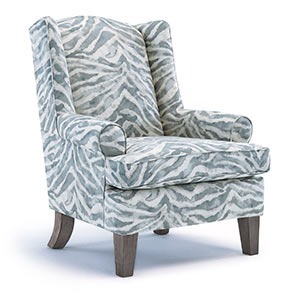 With soft fabric upholstery that comes in hundreds of colors and patterns, this chair will look as perfect in the nursery as it does in the living room. A button tufted back gives the Paisley that look of lavishness and familiarity. The hard-wood runners even come in two different finishes, Espresso or Riverloom, so you can pick the perfect setting for your oasis. Matching ottoman available. Bring traditional beauty back in to your home with the refined Andrea. 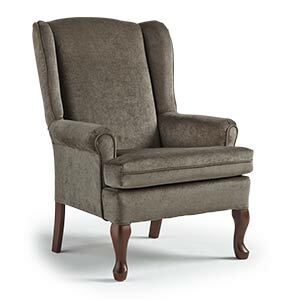 The classic wingback chair has a softly curved crown and four finish options for the stylish wood legs: Antique Black, Distressed Pecan, Espresso, and Riverloom. Choose one of the many fabric options in conjunction with the finish to make the Andrea completely unique to you and your home. 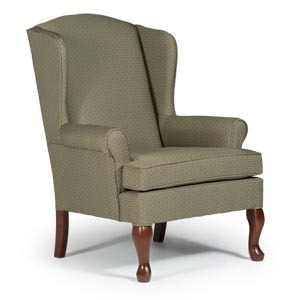 Enjoy the understated sophistication of this classic wingback chair with some updated facets. 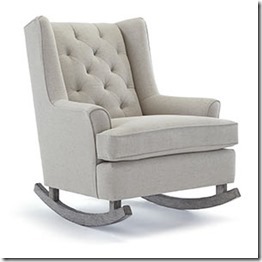 Just like the charm of old Hollywood, this accent chair has allure and many faces. Depending on the role you would like this T-cushioned chair to play, you can dress it up in a bold fabric pattern for a more contemporary look, or you can keep it simple with a muted solid tone that blends into the room. You can even select finishes for the tall tapered legs, such as Espresso, Riverloom, Antique Black or Distressed Pecan, creating the perfect accessory to your final look. Matching ottoman also available. The stately design of the Sylvia will bring timeless elegance to your home. This distinguished wing back chair invites guests to sip tea in comfort. 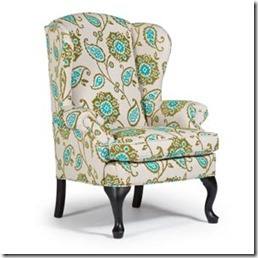 No matter which of the many fabric designs you choose, this chair will always be in style. A classic rich Dark Cherry finish can be chosen as well as more updated Antique Black or Riverloom. Either way, you can find the mood to perfectly complement your room. 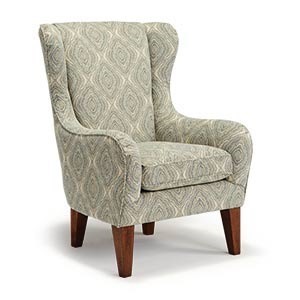 The dependable Doris wing back chair will always be there to welcome you home. With a sturdy, solid-wood frame, this expertly crafted chair will last from generation to generation. 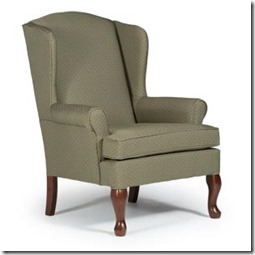 This simple and sophisticated wing back is an instant classic that blends well with traditional furnishings. Put your unique spin on a classic by choosing one of many fabric coverings. Once you have settled on fabric, choose between the Dark Oak or a Dark Cherry finish for the classic wooden legs. Reversible seat cushion. Matching ottoman available. Get groovy with the mod Karla. 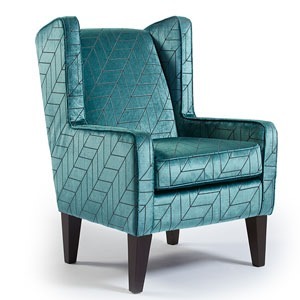 Let the fresh lines and angular style of this wing back chair bring new energy to your space. Choose a funky fabric covering and either the Espresso or Distressed Pecan finish for the complete look. The resilient, reversible, seat cushion remain comfortable year after year, so the Karla will feel just as good as it looks. Matching ottoman available. With infinite grace and whimsy, the Lorette’s updated wing back look is the perfect accompaniment to any room. With over 700 fabric cover options, you can choose from a simple understated solid or an ornate, vintage-inspired pattern. This chair features a reversible seat cushion that ensures years of comfort. Any fabric will look fabulous paired with your choice of either the Distressed Pecan, Riverloom or Espresso finishes on the wooden column legs. Also available with a matching ottoman.